Hey Brooklyn: You can have nice things now! Just thank a Dubai-owned department store chain. That's the gist of this New York Times article about high-end retailers looking to plant their flags in the borough—a story that begins, in all seriousness, "Brooklyn, the new bastion of cool for many New Yorkers, is poised to go mainstream chic." 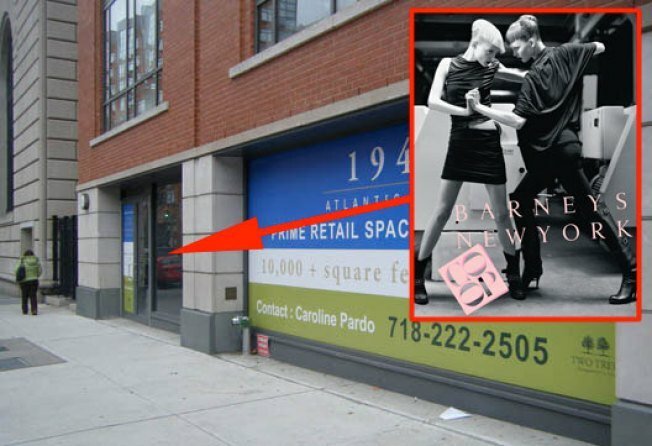 Now that a Barneys Co-op store is coming to a two-level space at 194 Atlantic Avenue in Cobble Hill, commercial real estate brokers say pricey retailers like Swarovski, Anthropologie and North Face are suddenly discovering this strange, mysterious land. Says one: "Someone needed to be first, and now that Barneys Co-op has done it, others will follow." So brave! Brooklyn's big-brand invasion isn't limited to just little old stores, of course. The Wall Street Journal reports that the Sheraton Brooklyn is set to open this week in the hotel hot zone that is Downtown Brooklyn's Duffield Street, ending the Brooklyn Marriott's monopoly on big bland hotels perfect for stashing out-of-town wedding guests.